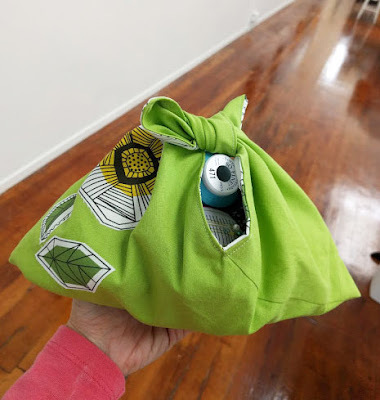 These little Japanese triangle bags are so simple and fun to make. They are a great way to wrap a gift and BE a gift all at once. What could be better and more eco-conscious than that? 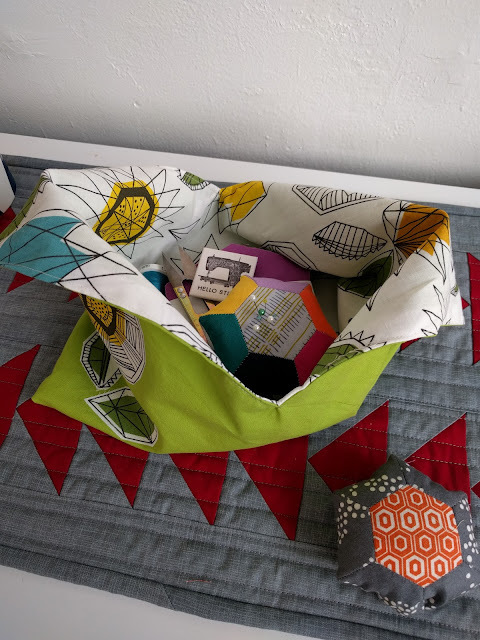 What I also love about these bags is that they are infinitely customizable (what sewing project isn't, really). The exterior of this bag can be embellished before construction with sashiko, fabric stamping, raw edge applique to name a few. And after construction, they can be adorned with big stitch around the top edge, tassels or even (gasp) pom-poms. Anyone who knows Hello Stitch knows we are quite smitten with those puffy little fluff balls - they look cute wherever they go! So - let's get down to the details! With your rotary cutter and ruler, cut 2 identical rectangles - one from each fabric. I have not tried anything smaller than 7x21, when you get smaller than that, it gets tricky tying the ends together. But if you try it and like it, please let us know! I also recommend using thinner fabric for one of your layers, cotton lawn or voile are great. That lighter fabric cuts down on the bulk just a bit, in a nice way. Two layers of quilting cotton will work just fine, though. *This is the time when you should embellish your exterior piece as you wish. Keep in mind, heavy stitching (sashiko) can shrink the fabric slightly, so if you plan lots of hand stitching, you might want to cut this rectangle a bit bigger and trim to the correct size after stitching. The 3:1 length to width ratio is key. t do what works for you. 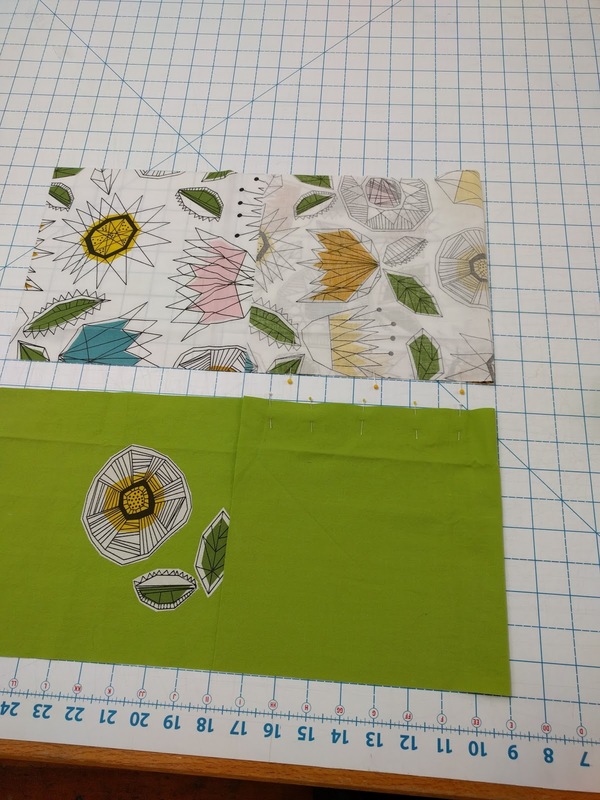 For example: a rectangle that is 30" long will be folded at 10 inches in from the right side. Fold both exterior and lining rectangles in the same manner - now comes the tricky part and you'll just have to trust me. It sounds strange but it works. 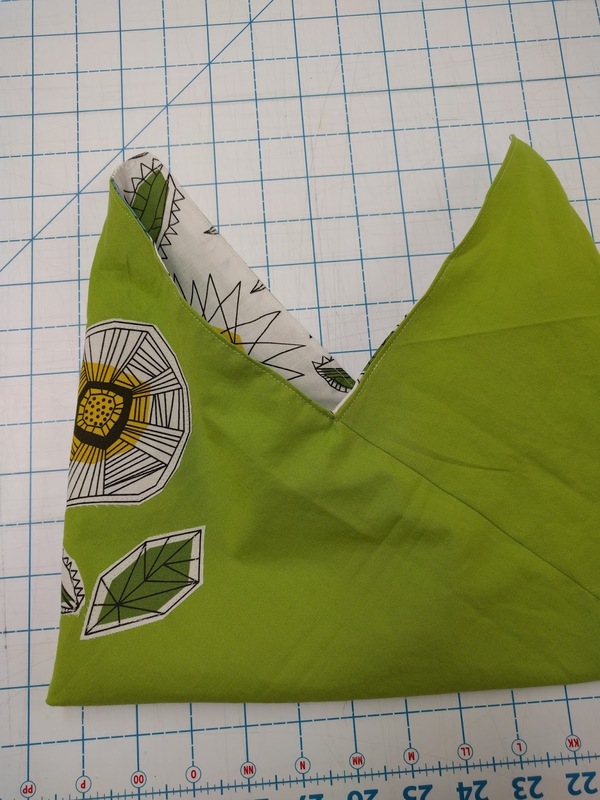 EXTERIOR: pin the two layers together at the top edge (green fabric in the picture) LINING: pin the two layers together at the bottom edge (floral fabric). This is super important - if you don't construct the bag this way, the lining and exterior will not line up when it's time to stitch the layers together. I've learned this the hard way! 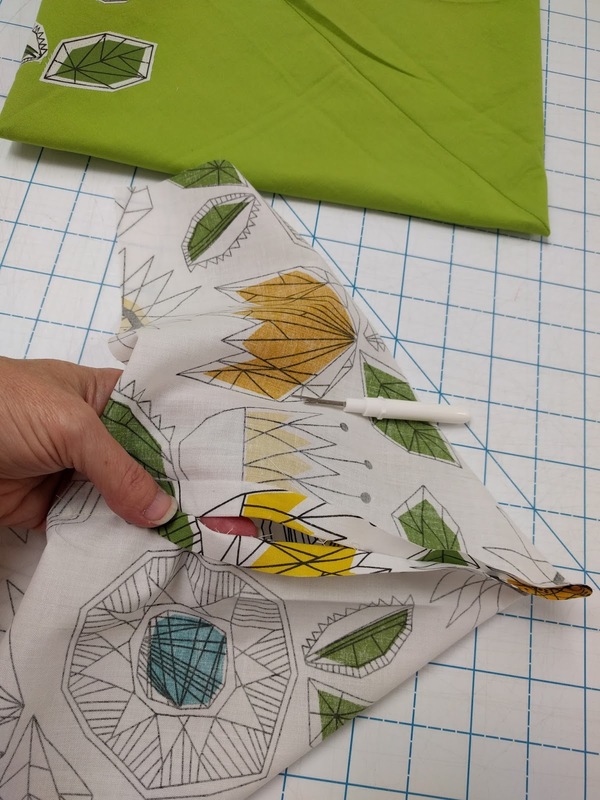 Sew the pinned edges with a 1/2" seam allowance, back stitching at both ends of the seam. After you stitch the seam, pull the loose corner down and away to make room for the next seam. See picture below. Repeat for both EXTERIOR and LINING. Fold the left third of your original rectangle in. This would be the same size fold you made in Step 2. (for example, if your original rectangle was 30" long, you will fold the left side in 10") If you have made this fold correctly, your piece of fabric is now a square. 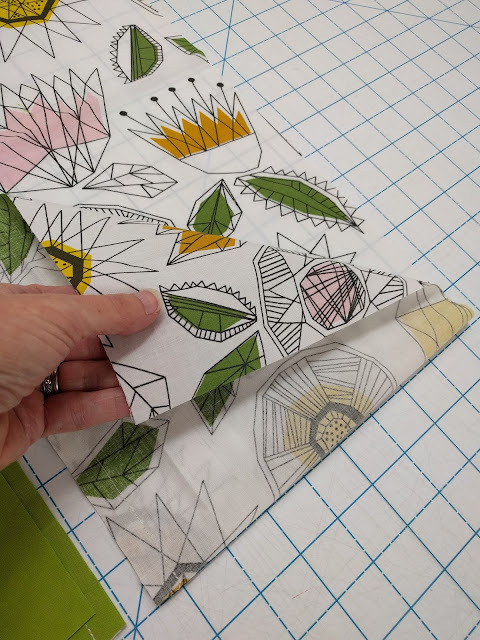 Do this step for both the exterior and the lining pieces. Next you will pin. The EXTERIOR gets pinned at the bottom edge, through 2 layers only (in Step 4 you pulled the excess fabric out of the way to make this possible) The LINING gets pinned at the top edge, through 2 layers only (in Step 4 you pulled the excess fabric out of the way to make this possible). **Note above, how the pin is going through two layers only, and you can see at the corner where the earlier section was pulled away. 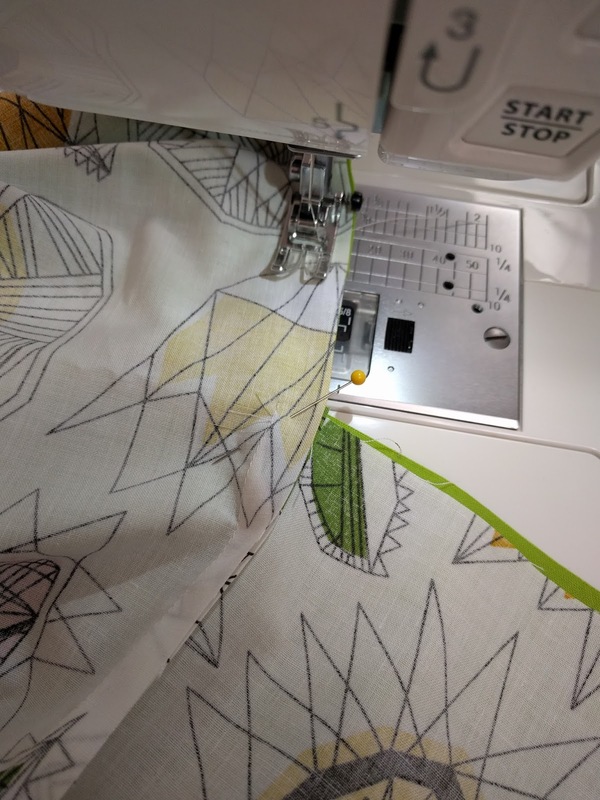 Sew the EXTERIOR with a 1/2" seam allowance, back stitching at the beginning and end of the seam. Try not to catch that extra layer in your seam if possible. My seam ends just shy of the very edge to help with this. 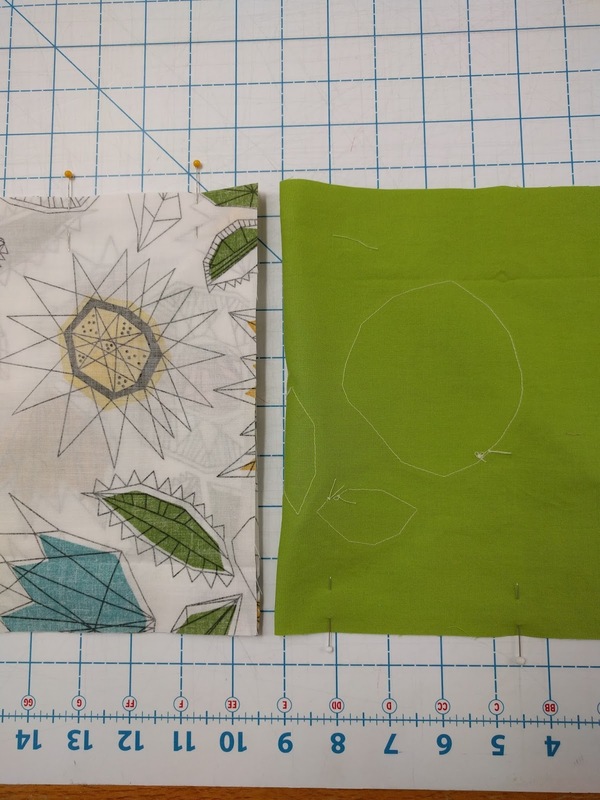 Sew the LINING with a 1/2" seam allowance , leaving a 2" section open (for later turning right side out). I forgot to leave a small section open and ended up picking some stitches out with my seam ripper (learning the hard way, again). 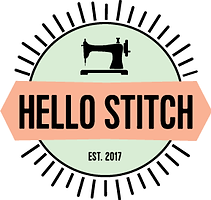 Don't forget to backstitch. If you accidentally get a tiny bit of that extra layer in your seam at this step, remember: seam ripper is your friend! Just snip away any of those stitches - it's okay if your seam doesn't reach the end of that side. Turn the bag EXTERIOR right side out. 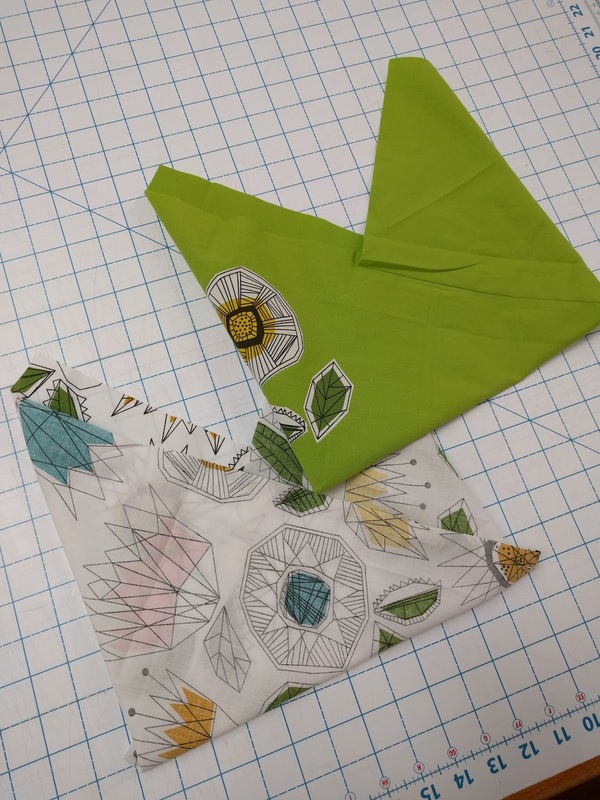 Place the EXTERIOR inside the LINING with right sides together, carefully lining up the edges of the two bag pieces. 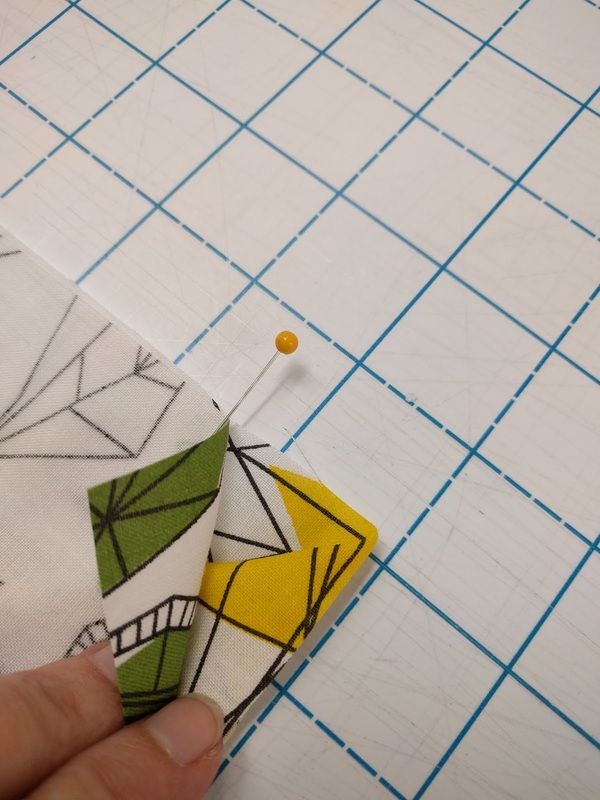 I also pin at this step (optional) and put pins at the two upper points, as well as at the two inside corners. Stitch all the way around this edge with a 1/2" seam allowance. And the pins... You can see the pin at the inside corner below. Trim the two points, and snip into the two inside corners (but don't snip the stitching). Turn the bag right side out through the hole you left in the lining. Press. Close up the opening in the lining with either machine or hand stitching. If this step is very neatly done, the bag may even be reversible. Edge stitch the top edge all the way around the bag with either machine or big stitch hand quilting. You're done! The bag's handle and closure are made by tying the two ends together. It's so clever, I wish I'd thought of that. It looks like lots of steps for a simple little bag, but it goes fast once you get it. Have fun making lots of triangle bags for gift giving this holiday season!